Rooming on this trip is twin-share. Single travellers will share a room with another traveller of the same gender. If you`d prefer not to share, a single cabin supplement is available at an additional charge. *Conditions Apply: All prices shown here are per person share twin (unless stated as single) in AUD, based on best available cruise fare at time of publication (28Mar19). All prices based on cash payment - credit card fees may apply. Cruise deposit, amendment and cancellation conditions apply. Travel agent service fees may apply. Special conditions apply - please ask for full details at time of enquiry. All passports, vaccinations and visas are the responsibility of the travelling guest to secure prior to departure from Australia. While we endeavour to keep our pricing as up-to-date as possible, the advertised prices shown here may differ from the prices in our booking system at time of reservation. Offer subject to availability at time of booking. We reserve the right to correct errors without penalty. Special is valid from 28 Mar 2019 to 07 Feb 2020 or until sold out/withdrawn. 7 Night cruise departing from Phuket to Penang onboard Panorama II. Hotel stay pre-cruise in Phuket. Visit the pristine islands, hidden waterfalls and laidback villages scattered along the Andaman Sea between Phuket and Penang. Enjoy the stunning west coast of Malaysia and Thailand on a new small-ship adventure cruise with Peregrine. Between the more popular holiday destinations of Phuket and Penang, there’s a medley of smaller islands and villages to explore, each with their own charms – and often far fewer travellers to contend with. Live it up in postcard-perfect Langkawi, choose from leisure and adventure activities in beachside Ao Nang, join in the relaxed pace of local life in Koi Yao Yai, visit waterfalls hidden in the jungle, and use the Andaman Sea as your swimming pool. With comfortable accommodation onboard, snorkelling and kayaking equipment, and knowledgeable local guides at your service, this is South East Asian paradise done in style. Sa-wat dee! Welcome to Thailand. No activities are planned today so you can arrive at any time. Information will be left for you at reception regarding the activities for day 2. Embarkation takes place between 2 and 4 pm. After meeting your leader and attending a welcome meeting and safety briefing on board, set sail at 5 pm. Enjoy dinner on arrival in Koh Yao Yai, relaxing and taking in the sunset. Climb aboard a songtheaw for a tour with a local guide. Koh Yao Yoi is known for beautiful beaches, friendly Muslim fisherman and diverse birdlife, not to mention some delicious local seafood. We set off in the early afternoon for the short sail to Ao Nang, a lively beachside town in the Krabi province. The night is yours to enjoy – perhaps kick back with a cold drink in one of the local bars. This evening, half of the group will head to Bung Ae House Homestay for an authentic, home-cooked Thai dinner. Tonight, the first group will go to Bung Ae House homestay for an included Thai home cooked meal. With a full day in Ao Nang, you’re free to partake in a range of optional activities. Whip up some local specialties in a Thai cooking class, spot colourful tropical fish on a snorkelling trip, take the adventure to the next level with some rock climbing, unwind with a traditional Thai massage, or make tracks on two wheels to a local waterfall. Another great option is to take a longtail boat to Railay Beach or for a cruise around Phang Nga Bay. Tonight, the second group will enjoy the hospitality and delicious Thai food at Bung Ae House. Tonight, the second group will go to Bung Ae House homestay for an included Thai home cooked meal. Arrive at around 7 am in beautiful Koh Rok, one of many beautiful islands with white sands and blue-green waters against a jungle backdrop. You’ll transfer to the island by Zodiac (a motorised inflatable boat). A full day of beach time is on the agenda, so enjoy some snorkelling, kayaking or paddleboarding. Otherwise, relax on shore and take in the postcard-perfect scene. A picnic lunch will be provided. Late tonight, set sail overnight for Tarutao National Park. Head over to Adang Island for some swimming and snorkelling. Set sail in the afternoon for Langkawi. You’ll see this is a town that has retained its everyday local life and spectacular natural beauty despite it popularity among travellers. The evening is yours to explore the town as you please, so perhaps dabble in the nightlife. Today, we take a trip to visit to the beautiful Telaga Tujuh Waterfalls – a lovely spot to relax and take in the jungle ambience. In the evening, set sail overnight for Penang. A leisurely sail brings you to Penang at around midday. Enjoy a delicious and fresh local Malaysian lunch at hawker food centre, and split up into smaller groups to join local guides for a walking tour around Penang’s old town, taking in the historic shophouses, narrow streets and unique atmosphere of the island. Take a rickshaw back to the ship and enjoy a farewell dinner onboard with fellow travellers. Your Adventure Cruise comes to an end after breakfast today. Disembarkation will take place between 8 and 9.30am. 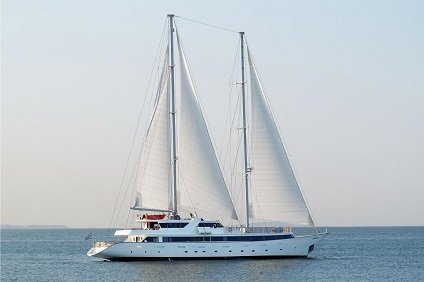 Launched 2004 and fully renovated in 2015, the Panorama II is your home on the seas. All cabins are finished with handsome wood trims and equipped with modern amenities – including air conditioning and mini-fridge – for your comfort. The restaurant area at the lower deck offers the perfect setting for meals, while the upper deck offers dining al fresco, and is a great spot to soak up the sun with a book. Our name stems from the word ‘Peregrinate’, meaning to migrate, walk or take a pilgrimage – very fitting for our beginnings as a trekking company. Since our inception, we’ve broadened our horizons and now offer small group journeys in over 80 countries across all seven continents, which can be enjoyed by anyone with an enquiring mind who enjoys getting off the beaten track (without forgoing some of the comforts of home). Introducing a new a style of travel – a premium cruise without the premium crowds. Think less on-board casinos and more island hopping along the Dalmatian Coast, Cyclades port stops for grilled octopus and fresh olives, or dropping anchor for a swim in some secluded Cuban archipelago. This is Peregrine’s small ship adventure cruising. Welcome aboard. Conventional big ship cruising is all about life on the boat. What to eat, what to do, which show to catch. Adventure cruising is more about the destination: stopping at little islands the big ships can’t reach, exploring local markets and trying fresh produce, learning a place’s history and culture from local guides who know it best. These journeys are designed to be low impact. That means there’s fewer passengers on-board, less stress on local communities, and each trip is carbon offset through a range of renewable energy projects. And while the big boats moor out at sea and ferry passengers to land by tender, we can sail straight into port. You can hop on or hop off as you like. It’s convenience and comfort, all in one. Category C: Located on the lower deck. 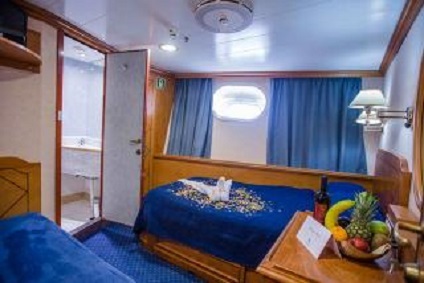 Each cabin has twin beds and porthole windows. 10.5–11 square metres in size. No matter which cabin you choose to stay in, you’re in for a comfortable trip. Each room has an ensuite with a toilet, shower and basic amenities such as a hairdryer. If the sundeck’s getting too warm, you can stay cool in your cabin with individually controlled air conditioning and a mini-fridge stocked with water. Rooms all have a satellite television, power plugs, internal phone, and a safe box to keep your valuables. Category B: Located on the lower deck. 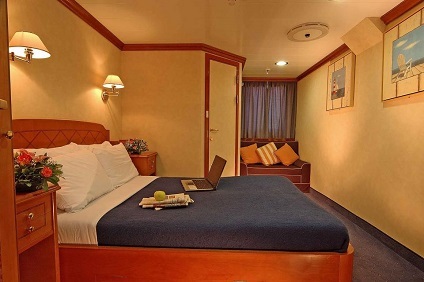 Each cabin has porthole windows with a choice of queen or twin beds. 10–13 square metres in size. No matter which cabin you choose to stay in, you’re in for a comfortable trip. Each room has an ensuite with a toilet, shower and basic amenities such as a hairdryer. If the sundeck’s getting too warm, you can stay cool in your cabin with individually controlled air conditioning and a mini-fridge stocked with water. Rooms all have a satellite television, power plugs, internal phone, and a safe box to keep your valuables. Category A: Located on the upper and main decks. 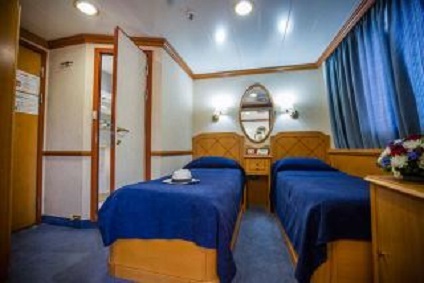 These are the largest cabins, with large windows and a choice between twin or double beds. 10.5 – 16 square metres in size. No matter which cabin you choose to stay in, you’re in for a comfortable trip. Each room has an ensuite with a toilet, shower and basic amenities such as a hairdryer. If the sundeck’s getting too warm, you can stay cool in your cabin with individually controlled air conditioning and a mini-fridge stocked with water. Rooms all have a satellite television, power plugs, internal phone, and a safe box to keep your valuables.